Note: Winner of the Sanford and Hopeful Stakes at Saratoga finished second in the Champagne and the Breeders' Cup Juvenile. 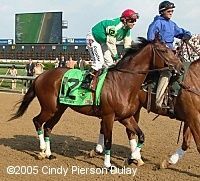 An easy winner in his 2005 debut in the Mountain Valley Stakes at Oaklawn. After a poor performance in the Rebel Stakes they found he had a lung infection but he bounced back in fine fashion to win the Arkansas Derby by 8 lengths. Finished third by a length in the Kentucky Derby then overcame a near fall in the Preakness to win by over 4 lengths.